In the theory of coalgebras, trace semantics can be defined in various distinct ways, including through algebraic logics, the Kleisli category of a monad or its Eilenberg-Moore category. 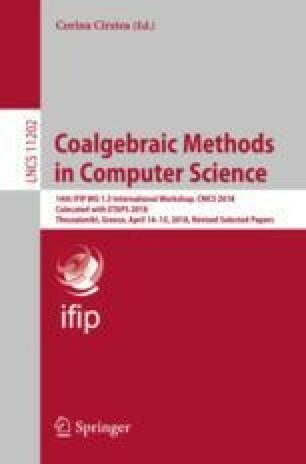 This paper elaborates two new unifying ideas: (1) coalgebraic trace semantics is naturally presented in terms of corecursive algebras, and (2) all three approaches arise as instances of the same abstract setting. Our perspective puts the different approaches under a common roof, and allows to derive conditions under which some of them coincide. J. Rot—The research leading to these results has received funding from the European Research Council under the European Union’s Seventh Framework Programme (FP7/2007-2013)/ERC grant agreement nr. 320571. We are grateful to the anonymous referees for various comments and suggestions.